I like Christmas letters. Since the advent of Facebook, the need for the annual brag sheet has diminished. Now people can brag every day–several times a day–with short blurbs and accompanying photos of the outfit, the meal, the cute pet, the precocious kid, the beach, the boyfriend, the award, the anniversary, the event…. I still receive several Christmas letters (and photo cards and traditional cards) every year. Some I anticipate and read instantly, others I set aside for a quiet afternoon because they take a little more work, or nerve, or caffein, or self-talk, to get through. You might be a Christmas letter writer (or are considering becoming one) and are wondering if people read (or would read) your humble offering. The answer is yes if you understand the purpose and apply a few simple strategies to the process. Why do we write an annual letter and send it to faraway friends and relatives? Think about what you are looking for when you receive a Christmas letter. You want snippets of news about the family: marriages, births, noteworthy accomplishments, moves, and other big news. And, ideally, you want to feel good after you’ve read it, not beaten down because in comparison to that family you’ve spawned a gaggle of losers, stalled out in your low-end job, and are ugly! Your purpose is to share the family news, not to convince, persuade, convert, sell to, brag, or influence the reader. It is to inform (share your life) so consider carefully what you include, and what you leave out. You might also want to inspire, entertain or encourage your reader. This can be done with a short humorous anecdote, some self-effacing comment that relates your humanness (I’m an average gal, just like you), or relating a heart warming anecdote that will evoke warm thoughts (not jealousy). If you write the letter, say I or me in the first paragraph and sign the bottom with your name. Since this will be one page only, all I have to do to identify you is glance down. Don’t be a narrator or a third party in your own story. It’s impersonal. The reader wants to know who (whom?) is speaking. Never go over one page. What?! I’m kidding right? No. I’m not. If you want to write a Christmas letter people will read, keep it short. This is the age of texting and emoticons my friends. One page max. What do restaurants do so they can charge ridiculous prices for small portions? They make it look pretty. A $50 coin-sized filet mignon on a platter is acceptable to the patron (not me, give me a teen burger) because of the fancy garnish and the elegance of white space. If your Christmas letter looks pretty, people will read it. What’s pretty? White space. Yup, the part with NO WORDS. The fancy paper is not what makes the difference. The key is what your reader sees at first glance. Does it look doable. It the page is crammed with words in a small font because you grudgingly are following the one-page rule but are still going to tell us three pages of factoids, it won’t get read. Well, not right away. Use a font at least 12, possibly 14, so it’s easy to see. Leave an extra line between paragraphs. Keep paragraphs short–no more than three lines. Emphasize with italics or bold, but sparingly. Use caps to SHOUT but only if you really must. Look at the page like it’s a photo, does it appeal? Does it invite you to read it? The answer is yes if there is enough white space to indicate you won’t have aged before you’re finished. Use bullet points for lists–factoids re: the kids and/or grandkids, jobs, moves, births, deaths, accomplishments (if you must brag, tell it to the person you would have written about and leave it out or find a way to share it humbly). If you can say it in 500 words you can say it in 250: remove needless filler words like “that, just, very” and many adjectives. Remember, this isn’t a novel. The reader does not have to picture the scene. Sleep on it, reread it, slash and burn once more. Pictures are worth a thousand words. A cute shot of the whole family, or just you (if you are single), or just the grandkids or you and your spouse on a hike, in front of the tree, in a sidewalk cafe in France…. My Christmas letters have morphed from two-pagers crammed with too many details when I began decades ago to picture postcards with bullet-point factoids on the back. One or two photos can convey a lot of information and lessen the need for all those words. Keep Collages Minimal: consider your reader/viewer. Put no more than four photos on a postcard sized collage. I broke this rule, when I was younger and could still see. Do you send a Christmas letter or photo card? Do you like getting them? Has Facebook removed the need? 45 Inexpensive Hobbies: are you having fun yet? If yes, why? What do hobbies do for you? What do you love about them? Do they feed your soul? Refresh you? Provide a creative outlet? I have several hobbies–gardening, home and yard reno, crochet, knitting, walking, skiing, reading, watching BBC mysteries, gym classes, and more–some of which I enjoy daily, weekly, monthly or seasonally. Key word: enjoy. I do them because I love them. They’re fun. They unclutter my soul. In this complex, serious, demanding, challenging, grown-up world, it’s easy to neglect, or even forget, how to have fun! God made fun. It was His idea, methinks. He made it for our good. Are you having any? Reading: the king of frugal hobbies. Check out the nearest library or visit used book shops, thrift stores, or recycle depots. Writing: start a journal, write letters to the editor, blog(see how easy it is), get pen pals, start that novel, write your own story. Learn a language: there are free resources available online. Podcasts: listen and learn on your commute. Check out Phil Callaway’s Laugh Again podcast and/or subscribe to Back to the Bible’s daily teaching. Educate yourself: You don’t need to own Encyclopedia Brittanica when you have free access to Wikipedia. Running: Cheapest exercise by far. All you need is shoes. Cycling: I have an old fashioned purple bike with huge handlebars, a basket, wide tires and a fat fanny seat. Most of the time a kid-hauler is attached so I can drag my grandkids (too small to ride their own bikes) to parks and playgrounds. The hills almost kill me but the children seem to enjoy the gasping and they cheer me on: Faster Grammy, faaaaaster!!! Become a Wikipedia editor: Help one of the most amazing internet resources stay current. Watch documentaries: My husband has become a bonafide expert on WWII history by watching docs. There are millions of documentaries on YouTube. Swap, don’t shop! Sign up to freecycle: an online community based on swapping things in your local area. Garage sale without leaving the house! Sign up to varagesale: sooooo jealous of my friend who found a small electric ice cream maker for $5!!! Makes the most amazing coconut milk ice cream for dairy intolerant ice cream lovers like me. hint hint…. Snorkelling: A trip to Grand Cayman Island to speak was my first chance to snorkel and it was love at first dive! Skiing: An hour ago I ordered two free ski passes with my airmiles–an annual tradition. If you own (or can borrow) ski equipment, can pack a lunch, and you live close to a ski hill, it’s the cost of the gas! Take a ramble: inspired by my reading of the life of C.S. Lewis and his contemporaries where rambling involved all day walks with overnight stays at inns, my version is simpler. I load a grandkid into the kid-hauler, add a couple older ones on their own bikes, pack a simple picnic and we ramble from park to playground to riverside to wherever, stopping to play and eat several times. After a few hours I call an adult to bring me a strong black coffee so I can go the distance! Fishing: if you can do it from shore or on a friend’s boat, it’s cheap and fun. Gardening: even if you don’t have a yard, you can garden in pots or boxes on your deck, verandah or window sill. Seeds are cheaper than bedding plants so start there. The internet is full of teaching and resources. Hiking: Gerry and I hike in Waterton National Park every summer and love it. Most communities have hiking or walking groups if you want to turn it into a social event. I added 50% to my distance by buying hiking poles. Camping: Once you have the gear (or can borrow it) it is an affordable way to holiday. Our kids loved it. We survived…. Start a supper club: Four couples max. Monthly or quarterly. Either have complete potluck where you all show up with one dish and take your chances, or have the host provide the entire meal. As long as you change hosts each time, you will share the workload. Host board game nights: Settlers of Catan is a popular choice but old standbys like Monopoly, Clue, Pictionary, and Trivial Pursuit are fun too. It’s more about the people you invite than the game so choose wisely…just sayin’. Chart your family history: We all know someone who does this–ask them for tips and get started. Make a new friend: don’t know where to start? The folks on your street. New people at your church. Other parents with kids in the same activities as your kids. Listen to Music: if you have an internet connection, check out Google Play music. It’s free and caters to every taste. Cooking: start with simple one-pot meals like soups, curries, chillis, stews. The Internet is jammed with great recipes and videos. Get cooking! Scrap booking: a failed experiment at my house but a raving success for my sister Lisa. I recommend the free online version. Crafts: my mother taught me sewing, Youtube taught me knitting and crocheting. My professional artist friend taught me techniques to paint my countertops. Whatever you want to learn can be found online or by asking someone who does it. Restoration: rebuild old cars, refinish furniture, and sell it or keep it. Learn to sing: join a choir in your church or community and let ‘er rip! Learn to cut hair: I buzz my hubbies head every week–it’s $20 in the bank every time. It adds up. Learn to preserve food: Canning, freezing, and drying are great supplements to your gardening hobby so you can eat those yummy products out of season. Woodworking: my nephew Brad, a talent agent for Hollywood hopefuls, took up this hobby in his 40s and it’s phenomenal the stuff he has made for himself and for resale. Volunteer: to a lot of charities, this is more valuable than your money; hospitals, senior’s homes and other organizations need your help. Coach or help a sports team: they always need somebody to handle equipment, organize tourneys, fund raise, and cheer. Mentor: You don’t have to be an expert to mentor; you are a fellow struggler further along on the journey! Visit local museums, art galleries, farmer’s markets, parks, nature reserves, historic buildings, and other free publicly accessible places. Put together your own guided tour for your out-of-town visitors. Attend free festivals, concerts, parades, and exhibitions (e.g. : classic cars) in your area. Puzzles: set one up on a card table in a corner over the holiday season. Buy them for pennies at thrift stores. Build models: Not just for kids! Become a birder: See how in 4 easy steps. Play an instrument: dust off that old clarinet or piano or tuba…no, not the tuba! Minimalism: Get rid of the stuff that owns you! So what are your hobbies? Jump in with the ideas I missed. 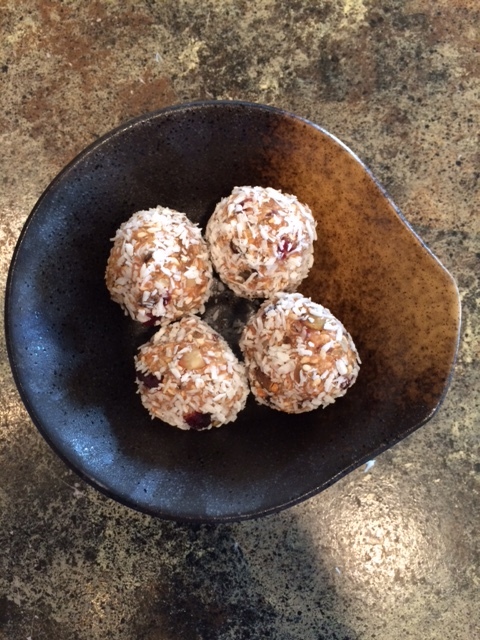 I brought along some homemade Energy Balls to share on a hike to Larch Valley with some friends. Everyone wanted the recipe so here it is. GLUTEN FREE, DAIRY FREE, NUT FREE AND SO STINKING GOOD! Spread balls on a cookie sheet and freeze. Store frozen balls in tupperware or ziplock bag in freezer. They are easy to grab and go when you are in a hurry or need a quick snack to plate out. Chocolate Cupcakes as good as a mix! Honestly speaking, I’ve always found cupcakes from a mix far better (as in finer texture, lighter, fluffier) than my “scratch” cupcakes that tended to be heavy as mud. However, because of family food allergies, I try to make everything from scratch so I can avoid all the additives and ensure it is dairy free. I hunted for years for the perfect chocolate cake/cupcake recipe and I think this is it. My kids, and now my grandkids, all love it. Preheat oven to 350 degrees F (175 degrees C). Line a muffin pan with paper or foil liners. Sift together the flour, baking powder, baking soda, cocoa and salt. Set aside. In a large bowl, cream together the butter and sugar until light and fluffy. Add the eggs one at a time, beating well with each addition, then stir in the vanilla. Add the flour mixture alternately with the milk (THIS IS THE MESSY PART — THE DRY COCOA RISES LIKE A CLOUD! DRAPE A TEA TOWEL OVER THE MIXER UNTIL THE COCOA IS MIXED INTO THE BATTER); beat well. Fill the muffin cups 2/3 full. 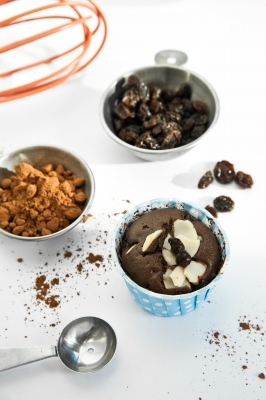 Bake for 15 to 17 minutes in the preheated oven, or until a toothpick inserted into the cake comes out clean. Frost with your favorite frosting when cool. Makes one dozen cupcakes. 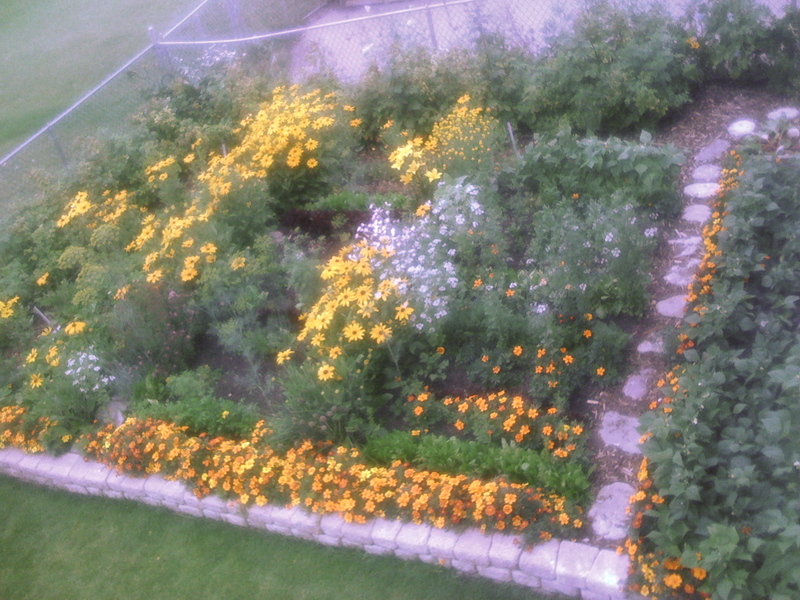 Anyone who knows me knows I am crazy about gardening. 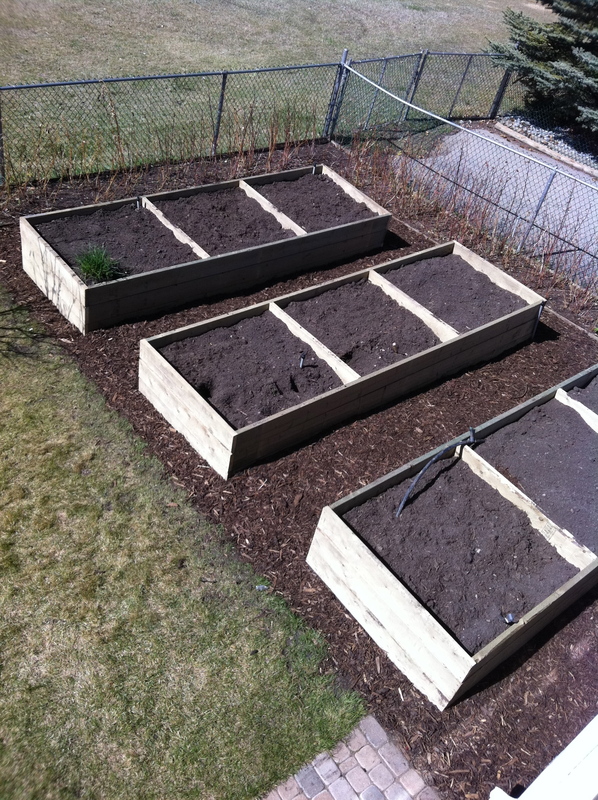 This year we changed our garden from the traditional style rectangular dirt patch to three large raised beds — see photo on left. Our old garden (seen below on the right) was about a foot higher than the lawn and the dirt was held in place with a stacked stone wall, three stones high. Gerry dismantled that wall since it was no longer needed in the new garden plan. That meant I suddenly had 90 stones available for whatever I wanted! Gerry and I decided to remove the two-foot strip of lawn that encircled our round stone patio/firepit and replace it with a raised bed flower garden that would run halfway around the highest end of the patio. Since our lot is sloped, the patio is ground level near the house but is about two feet above the lawn on the opposite end of the circle. Building a stone wall on a slope is quite simple if you have two essentials (sand and a spade) and three simple tools (a level, a measuring tape, and a rubber mallet). Obviously you need landscaping stones as well. You can start anywhere you want — in the middle and work to both ends or at one end and work to the other. That’s what I did. As you can see in the photo to the left, my wall began at the firepit and it was two bricks high. As I turned the corner and headed around the slope, the wall eventually became four bricks high. At that point, I decide I didn’t like the look of the wall that high and I dismantled it and started again with one fewer row of bricks. The final result was a wall that was three bricks high at it’s highest point and one brick high, almost level with the lawn, at both ends. Here are the easy steps for constructing a wall that is level, even though the ground slopes. 1. Dig out the sod in the area where the bricks will lay. Have a couple of 50 lb sandbags on hand — no problem for the average Canuck who keeps a few sandbags in the back of the truck for better handling on icy roads in our endless winters. 2. Put some sand in the trench where you are going to lay your first brick — the sand is easy to shift and that’s the secret to getting your brick to lay level. Place the brick on the sand and the level on top of the brick and tap the brick with the rubber mallet until it is level. Be sure to check it from side to side and front to back. 3. Add stones and sand, being sure that you use your level to keep everything flat. You’ll be able to tell when it’s time to dig in a new level of stones because as the ground slopes away in front of your row, you will see that it will take too much sand to keep your stones high enough to be level with those already laid. When you start a new row, you will have to dig the first couple of stones in a little deeper than the natural slope of the ground. As long as you keep checking with your level, it will turn out fine. Be sure to stagger the stones so that the spaces between the stones do not all line up. 4. 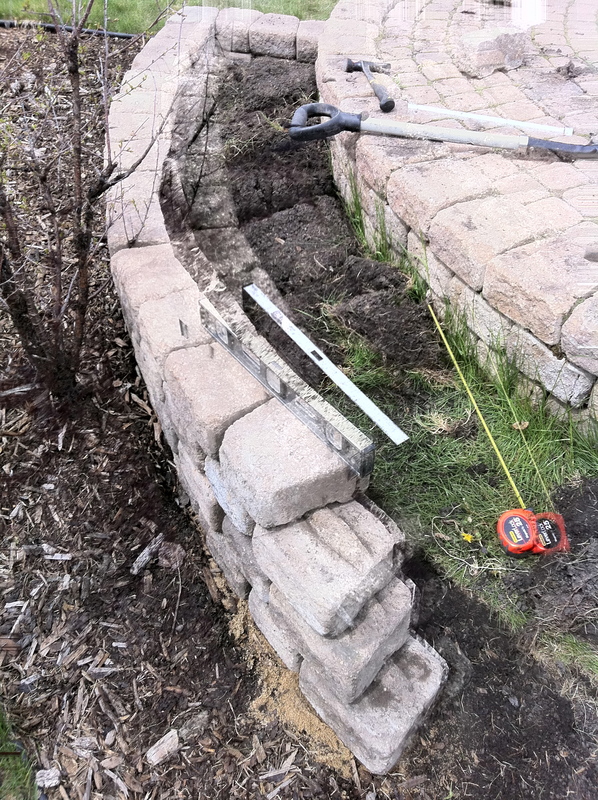 If you are following the line of an existing stone wall, as I was, use your measuring tape to check each new stone to be sure it is the same distance away from the wall. 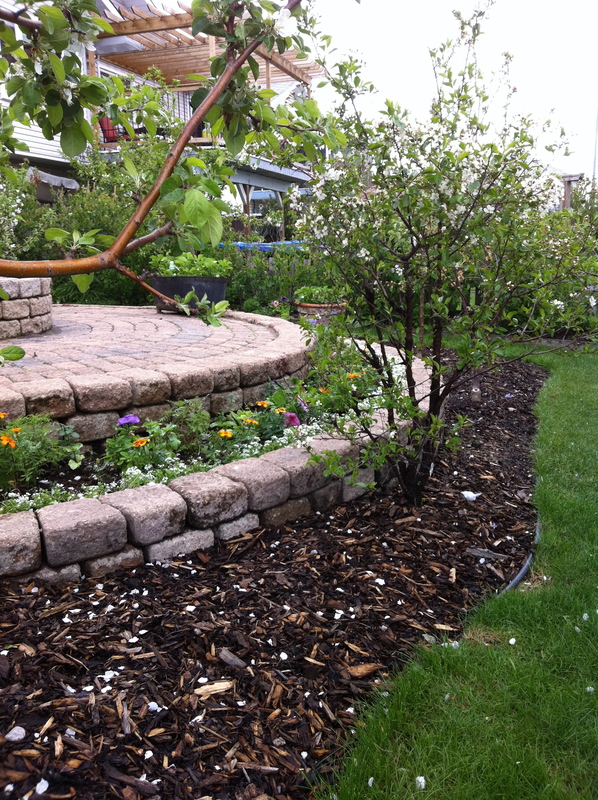 Since landscape stones have imprecise edges don’t be worried if you are over or under 1/2 inch on your stones. Fairly close is close enough. 5. Keeping your top row level is so important that several times you will likely take down an entire section (because, like me, you’re an amateur!) 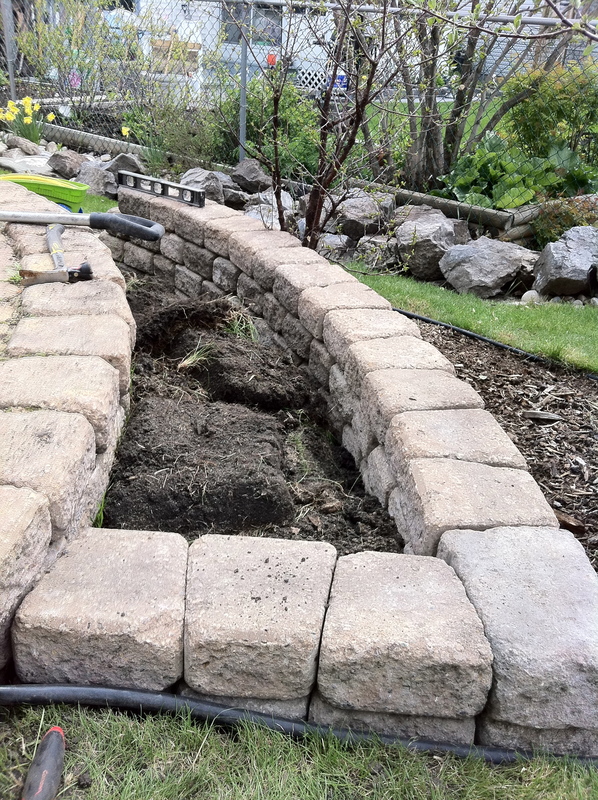 and by adding or removing some sand at the base and then replacing the stones, you will achieve a level wall. 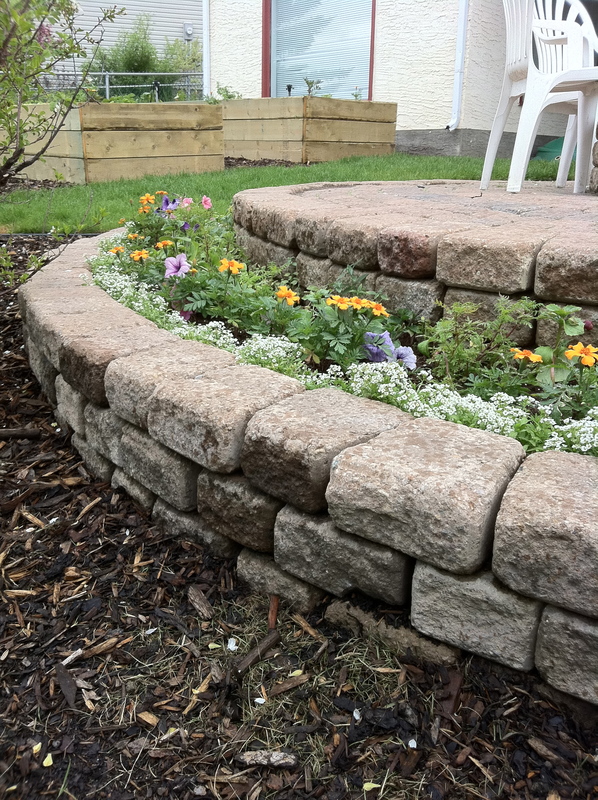 If the wall is level, not only will it look better, the stones will be sturdier so that you will be able to sit or stand on them without that tipsy wobbly effect. 6. As you come around the curve and the ground slopes back up, you will stop adding rows and start removing them. Toward the end of a given row, your last bricks will be dug in more deeply than the ground around it until the top of that brick is level with the ground and the row above it will have a brick sitting half on the last brick and half on sand in the trench. Take your time to be sure this brick is completely level before continuing or you’ll be coming back with your spade and sand to fiddle with it until you get it right. As you can see by the photos of the finished wall, it is a nice feature to add to the yard especially since it also removed a strip of grass that was difficult to mow. Now all we have to do is stick in some blooms in the spring, pull a few weeds in the summer and the result of a day’s work is quite lovely and enduring. 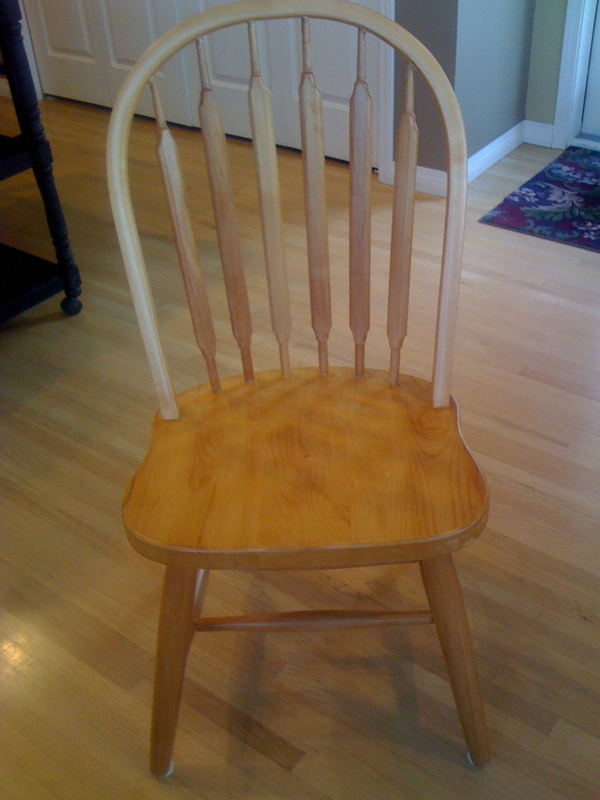 In 1993 we built a new house and bought a very solid, alder-wood table and six chairs for our kitchen. It was costly but we saved one third by buying it unfinished and doing it ourselves (read: “myself.” Gerry hates finicky handiwork). 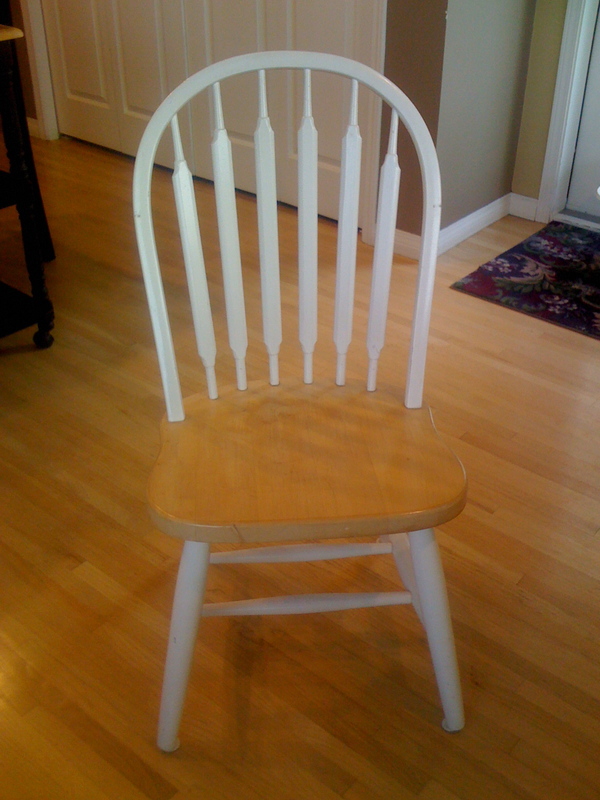 I painstakingly taped and painted and varnished to achieve that trendy white and wood look. It was tedious, labor-intensive and exhausting. But I loved the finished product…for about five years. However, the memory of all that work convinced me that I still liked it for at least another five years. I have seriously hated it for the last five years. But every time I thought about changing it I remembered how many hours (yea verily, weeks!) it took me to paint and varnish it the first time. The prospect of first removing all that paint and varnish and then starting over was daunting. (NOTE: you cannot remove melamine paint with stripper; it must be sanded off. Guess what kind of white paint I used?) I even came to the point of considering putting the whole thing up for sale on Kijiji and buying something I liked. And then my Jewish-Chinese-Scottish roots kicked in. Just kidding, I’m Irish but cheap. I got that line from Uncle Gee, a Chinese tea hustler in San Francisco — I’ll blog about him soon so stay posted. The reason we paid a lot of money for this furniture back in ’93 was so that I wouldn’t have to endlessly “consume” but I could simply refinish it as the trends changed. Off to the hardware I went. I bought a new mouse sander, set up a workshop in the basement, rolled up my sleeves, put on a mask and started sanding the first chair. I burned out the sander in two days. Back to the hardware for a replacement sander. I continued sanding but not quite so aggressively. In a week of spare-time sanding, I finished removing all the old paint and varnish. Then I applied three coats of a matte finish urethane, hand sanding between each coat to remove air bubbles. It looked good. Christmas came and I took a break. January came. I’m still on the break. Suddenly I’m feeling old. And tired. And I have a book to write. I think I’m starting to like the look of my one-of-these-things-is-not-like-the-others kitchen set. Here’s a cheap and easy gift or party favor for the holidays. It can also be a (slightly messy) fun craft to do with children. My granddaughter, almost four, patiently helped me fill about 30 balloons last night after her two-minute “performance” with her French preschool class. She never sang, nor danced, nor even flinched. Just stood there looking mildly amused while her teacher “led” the one or two kids who sang and did the actions. Most of them, like Jasmine, stood in silence while cameras flashed frantically in the hands of parents and grandparents. Mix 1/4 cup cornstarch into every cup of cornmeal. 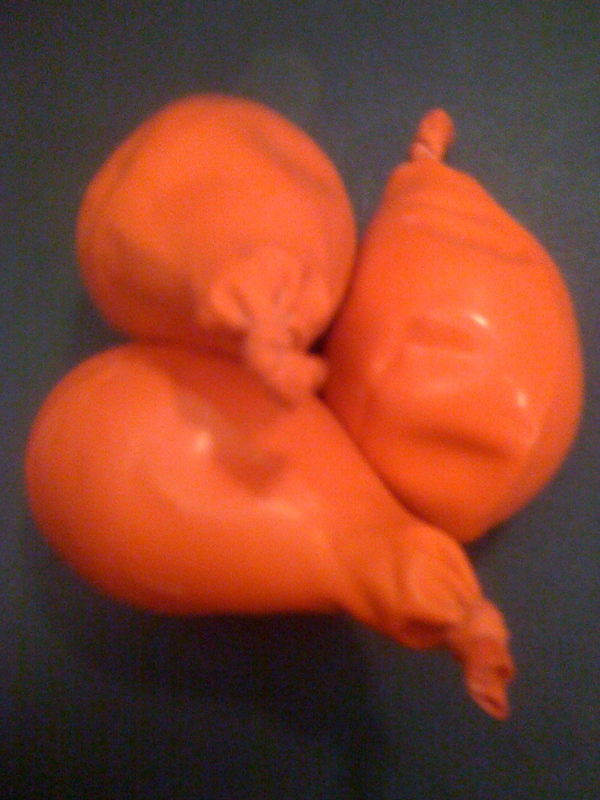 Inflate each balloon before using it, to loosen it up. Release air and insert the funnel into the neck of the balloon. Spoon about 1/4 cup of cornmeal/cornstarch mixture into bowl of funnel. Gently shake or tap to get cornmeal into balloon. Use the kebab stick to poke it into the funnel neck if it stops flowing. 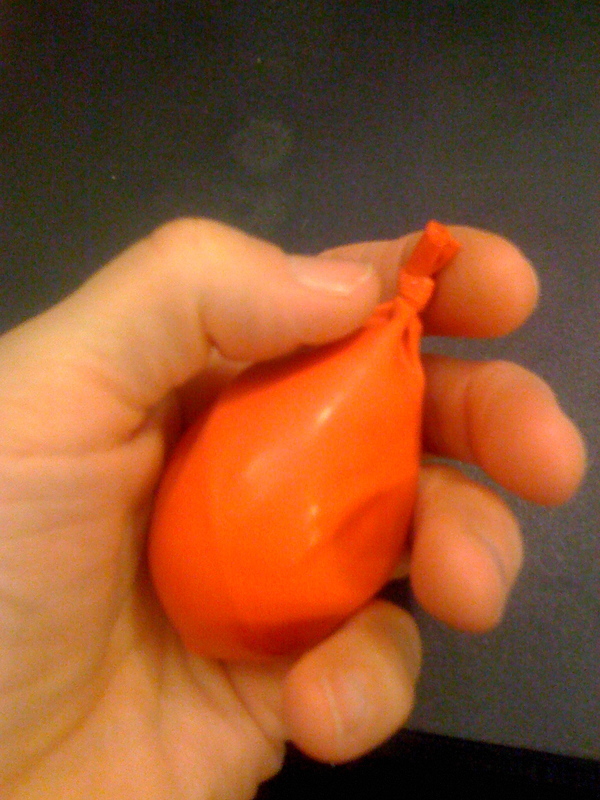 Remove the funnel when the round body of the balloon is filled. Dump any excess out of the neck of the balloon. Tie the neck in a knot close to the body of the balloon. Cut off the lip and excess neck of the balloon. I handed out free stressballs and hugs earlier today after talking to single moms about how to handle holiday stress at Center Street Church in Calgary. But I had to save a few for myself so I can make it through the holidays without hurting anybody! Squeezy…..squeezy…..aaahhhhhhhh. Merry Christmas! This is a soup that can be made, start to finish, in about 30 minutes. You can make it ahead and store it in the fridge in a sealed container. It is so delicious, it won’t last long. Hearty and filling, it’s almost sweet enough to count as dessert — but no guilt! I made two batches, one with red-fleshed sweet potatoes (the huge ones with the wine-colored skins) often used for yam fries and one with yellow fleshed sweet potatoes (smaller brown skinned variety). The soup in the photo is a mixture of the two so don’t try to match the color — unless you also use some of each type like I did. There is no cream in my soup (lactose intolerant) and it was plenty “creamy” without it. In a large pot, combine sweet potatoes, water, salt and cinnamon. Bring to a boil. Reduce heat and simmer, covered, for 20 minutes. Meanwhile, in another large saucepan (frying pan), cook and stir onions and pears over medium heat for 5 min’s or just until the onions are transparent. Don’t brown them. Stir into sweet potato mixture. Remove from heat, whisk in grape juice and cool slightly. 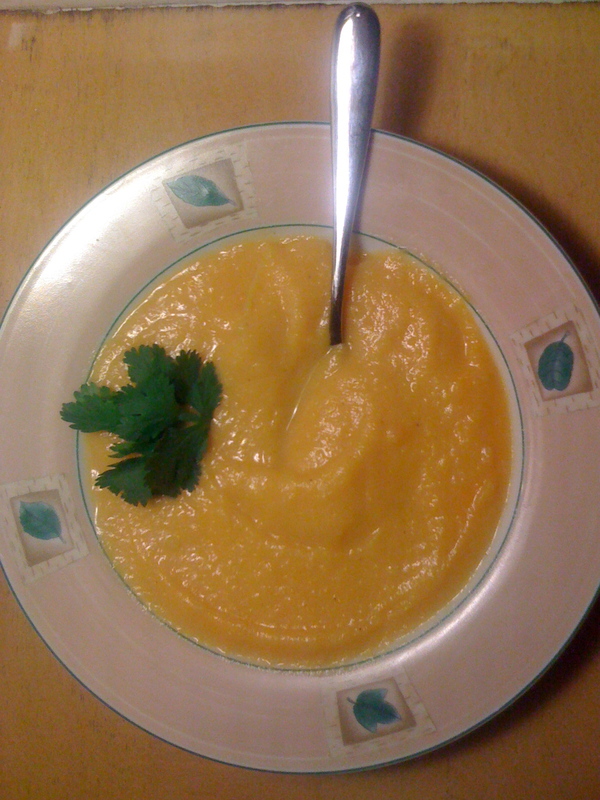 In a blender, cover and puree soup in batches; BE CAREFUL. Don’t fill blender more than 2/3 full and start on a lower speed setting (gradually increase speed) or you will have an explosion that can leave a huge mess and nasty burns. Before eating, stir in the cream and pepper and heat but DO NOT BOIL. This soup stores well in the fridge and can be enjoyed a bowl at a time. It can also be frozen. Finding a red pepper in my washer this morning — I’ll explain later, and no it’s not early-onset dementia — reminded me of something my sister Diane taught me years ago: clean your fall harvest of garden carrots (potatoes, etc) in the washing machine. If you have a garden and plant root crops — potatoes, carrots, turnips — nothing works better for cleaning a large amount of fresh-picked tubers than the good ole Maytag (or whatever brand of washer you happen to use). Just dump in the vegetables and run the machine on a cold wash and rinse (no soap) and a gentle spin and VOILA! You’ve just saved yourself hours of scrubbing. Bag and refrigerate your veggies and wipe out or shop-vac the detritus from the washer. So how did the red pepper get into the wash? Another tip, keep your vegetables in cotton bags in the crisper drawers — I use old pillow cases cut in half. The cloth bags allow the veggies to breathe and they keep longer without rotting. Every week or so, I toss the cloth bags in the wash to freshen them up — I guess I didn’t see this little pepper from Gerry’s greenhouse in the bottom of the bag. It’s clean now!